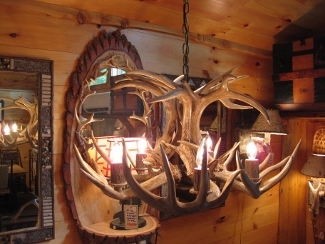 We have both genuine and simulated antler chandeliers and they are available in many sizes and styles. 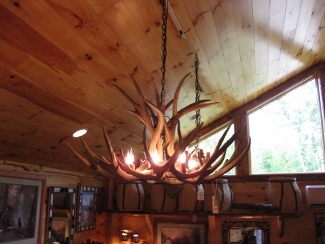 Many genuine antler chandeliers are on display in the store and they can be custom made for you with three antlers up to a rack of forty. 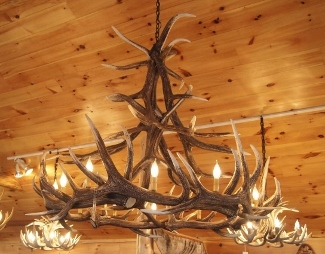 The price range is very reasonable, from $395.00 for a small chandelier to $7,500 for a huge, spectacular, authentic moose antler chandelier. 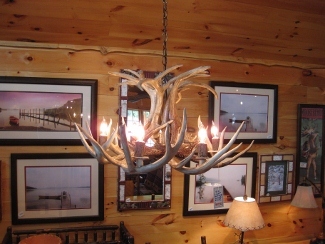 We have expert antler chandelier craftsmen that can custom make any style or dimensions you may need. 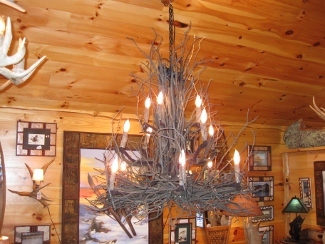 We also have a stunning selection of real hickory twig chandeliers that are handmade and very unique. 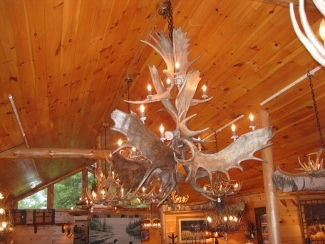 We have many chandeliers on display in our gallery for you to view. 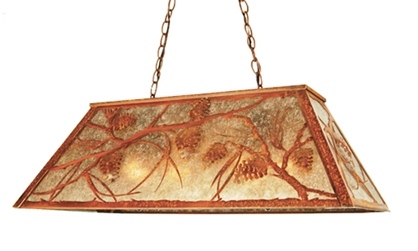 In our showrooms you will find many, many great looking table lamps to choose from. 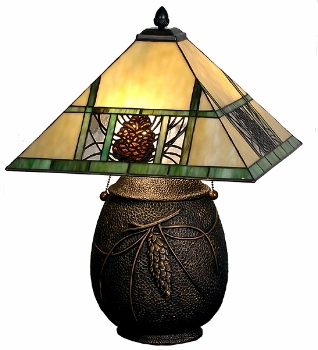 We have lamps in a warm mahogany finish with amber mica shades and bold moose and bear sculptures with faux rawhide shades or cloth shades. 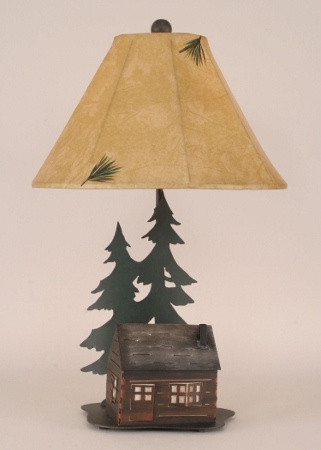 The unique table lamps with cut wrought iron shapes of a hiker have shades with hiker boot prints; others have a moose in a hammock under evergreens, a walking bear in the woods and a big chubby bear under an amber lamp shade. 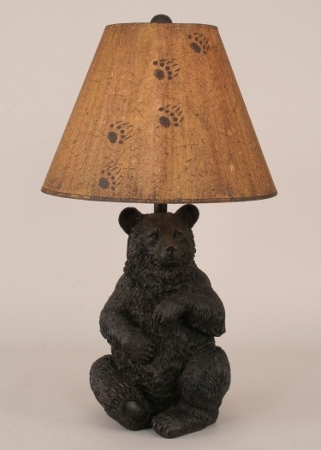 We have snow shoe lamps, fishing pole lamps, solid base table lamps with a selection of scenes of climbing bears, cubs in a canoe, or moose in the woods. 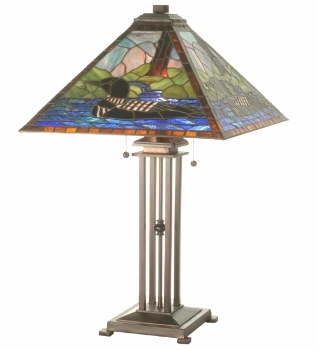 All of our table and floor lamps come with a shade that will set off the lamps perfectly. 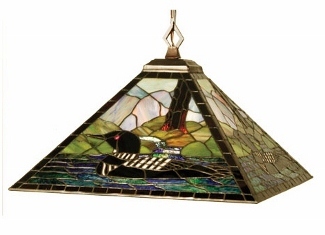 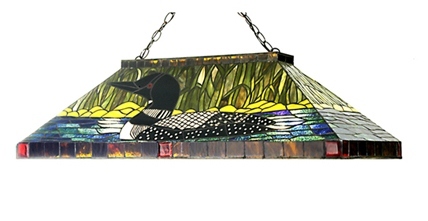 Our beautiful, genuine stained glass lamp shades are brilliantly colored with detailed North Country designs in loons, wood ducks, fly fisherman, moose and bear. 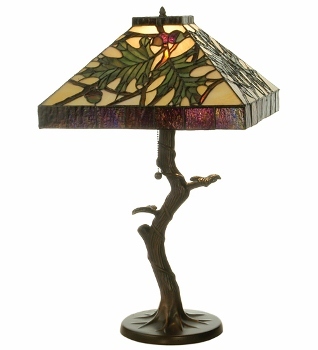 Floor lamps are always hard to find, so take a look at what we have. 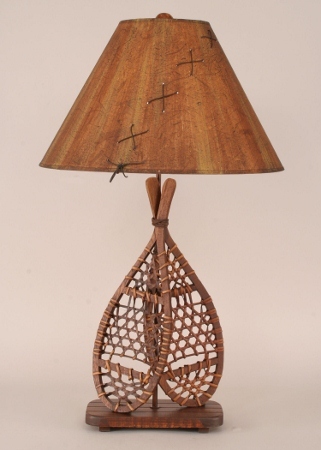 Select from many styles of rustic designs; fishing poles, snow shoes, pinecone, etc with sturdy floor lamp bases. 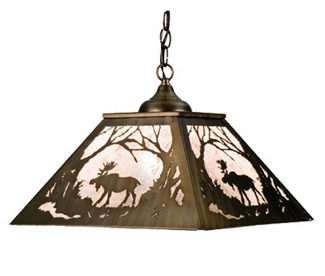 All have rustic shades in faux rawhide or fabric sepia tone shades and the shades are painted with rustic designs of canoes, paw prints, hiking boot prints, bear, moose, pinecones, and other Adirondack scenes. 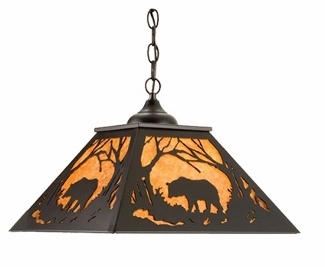 Be sure to stop in and see our new stock of North Country Style Lighting.